Rev up your engines for this unforgettable collection of Cars Toons starring Mater, the loveable and hilarious tow-truck from the hit movie Cars. From the creative minds of Disney Pixar come nine highly entertaining "Tall Tales" involving bullfights, drag races, rock concerts, monster truck showdowns and even UFOs - plus, check out the new, never-before-seen Cars Toons Mater Private Eye and Moon Mater. Join Mater, the heart and soul of ..
From the creators of Finding Nemo, Up and Toy Story 3. Take an incredible ride, loaded with laughs, as you enjoy all 3 Cars movies in one amazing set. Get the full Cars experience with this 3-movie collection! Cars: Hotshot rookie Lighting McQueen discovers that there's more to life than trophies and fame. Cars 2: Lighting McQueen and Mater head overseas to compete in the first-ever World Grand Prix. Cars 3: Lighting McQueen must face a..
Own Cars / Cars 2 / Cars 3 DVD from Deff, DVD, Blu-Ray & 4K Video Specialists - Free UK Delivery..
From the creators of Cars, Up and Toy Story 3 comes a new Pixar classic for the entire family. Star racecar Lightning McQueen (Owen Wilson) and the incomparable tow truck Mater (Larry the Cable Guy) take their friendship to exciting new places when they head overseas to compete in the first-ever World Grand Prix to determine the world’s fastest car. 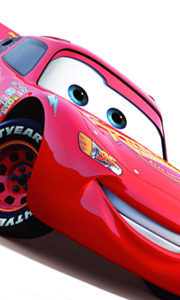 But the road to the championship is filled with plenty of potholes, detours and hilariou..
Disney/Pixar's Cars, the high-octane adventure comedy from the creators of Toy Story, The Incredibles and Finding Nemo, now looks and sounds better than ever in this Blu-ray disc created from the original source file. Hotshot race car Lightning McQueen (Owen Wilson) is living life in the fast lane - until he hits a detour and gets stranded in Radiator Springs, a forgotten town on Route 66. There he meets Sally, Mater, Doc Hudson (Paul N..
Fasten your seat belt and prepare to experience this mind-blowing, turbocharged 3D presentation of Disney Pixar's epic adventure - a high-octane hit packed with heart, hilarity and full-throttle Fun! Blindsided by a new generation of blazing-fast cars led by arrogant hotshot Jackson Storm, Lightning McQueen (Owen Wilson) is suddenly sidelined. To get back on track, he'll need the help of some remarkable friends and legendary racers. 'Ca..
From Disney-Pixar, creators of Finding Dory and Academy Award winner Inside Out (Best Animated Feature Film, 2015), comes an epic adventure packed with heart, hilarity and full-throttle FUN! Blindsided by a new generation of blazing-fast racers led by arrogant hotshot Jackson Storm, the legendary Lightning McQueen (Owen Wilson) is suddenly sidelined and pushed from the sport he loves. To get back on track, he'll need the help of eager y..
Own Cars 3 DVD from Deff, DVD, Blu-Ray & 4K Video Specialists - Free UK Delivery..
Pixar’s landmark classic goes full throttle off the screen and into your living room for the first time ever in spectacular Blu-ray 3D. From the acclaimed creators of Toy Story, The Incredibles and Finding Nemo comes a high-octane adventure comedy that shows life is about the journey, not the finish line. Hotshot rookie race car Lightning McQueen (Owen Wilson) is living life in the fast lane until he hits a detour on his way to the most..
From the acclaimed creators of Toy Story, The Incredibles and Finding Nemo comes a high-octane adventure comedy that shows life is about the journey, not the finish line. Hotshot rookie race car Lightning McQueen is living life in the fast lane until he hits a detour on his way to the most important race of his life. Stranded in Radiator Springs, a forgotten town on the old Route 66, he meets Sally, Mater, Doc Hudson and a variety of qu..
Own Disney Pixar - Cars Poster Mug from Deff, DVD, Blu-Ray & 4K Video Specialists - Free UK Delivery..
Own Cars 3 - Duel For The Piston Cup Mug from Deff, DVD, Blu-Ray & 4K Video Specialists - Free UK Delivery..
Own Cars 3 - Duo Mug from Deff, DVD, Blu-Ray & 4K Video Specialists - Free UK Delivery..
Own Cars 3 - Legend Of The Track - Hudson Hornet Mug from Deff, DVD, Blu-Ray & 4K Video Specialists - Free UK Delivery..
Own Cars 3 - Legend Of The Track - Louise Barnstormer Nash Mug from Deff, DVD, Blu-Ray & 4K Video Specialists - Free UK Delivery..
Own Cars 3 - Legend Of The Track - McQueen Mug from Deff, DVD, Blu-Ray & 4K Video Specialists - Free UK Delivery..
Own Cars 3 - Legend Of The Track - River Scott Mug from Deff, DVD, Blu-Ray & 4K Video Specialists - Free UK Delivery..
Own Cars 3 - Storming Through Mug from Deff, DVD, Blu-Ray & 4K Video Specialists - Free UK Delivery..
Own Disney Pixar - Cars Casa Della Tires Mug from Deff, DVD, Blu-Ray & 4K Video Specialists - Free UK Delivery..
Own Disney Pixar - Cars Casa Della Tires Wrap Mug from Deff, DVD, Blu-Ray & 4K Video Specialists - Free UK Delivery..
Own Disney Pixar - Cars Champ Mug from Deff, DVD, Blu-Ray & 4K Video Specialists - Free UK Delivery..
Own Disney Pixar - Cars Cozy Cone Motel Mug from Deff, DVD, Blu-Ray & 4K Video Specialists - Free UK Delivery..
Own Disney Pixar - Cars Radiator Springs Mug from Deff, DVD, Blu-Ray & 4K Video Specialists - Free UK Delivery..
Own Disney Pixar - Cars Rust-eze Mug from Deff, DVD, Blu-Ray & 4K Video Specialists - Free UK Delivery..
Own Disney Pixar - Cars Tow-Mater Mug from Deff, DVD, Blu-Ray & 4K Video Specialists - Free UK Delivery..